This past week has been one of those weeks in the Lyme journey. The weeks where everything seems to collide into a messy and huge tornado of everything that could go wrong does. Even the weather didn't seem to want to cooperate this week. *smiles* We traveled to NY so that I could receive some treatment that we believed would help specifically with pain. Unfortunately the day after we arrived from the long two-day trip (that is always difficult on my body) I came down with a gastrointestinal virus and spent the night violently ill which resulted in spending the next day at the hospital due to severe dehydration. If you are not a Lymie and you are reading this you probably are thinking, "Oh that is so sad that she had to deal with that"... but if you are a Lymie and reading this you are shaking your head because you understand that recovering from a "gastrointestinal virus" can throw everything off. And it has. The pain in the last few days has been excruciating and unbearable and because I couldn't keep food or liquids in me I couldn't take anything, not even tylenol. All of the vitamins that I have been thrilled to be able to take throughout the day that has taken me over a year to work up to? Having to start at ground zero all over again. Yes, hopefully this run will be quicker but knowing my sensitive system it will take weeks (hopefully) or months to get everything back in. The medication that I was supposed to start? All three of them are now delayed. Once again things are delayed. I went on to Social Media this past week and came across seven different stories of people who I know who fought serious health issues within the past two years. Their journey's have been difficult, took all of their energy and determination but all seven of them (Praise the Lord!) are doing well. I also received a couple of emails and facebook messages from some of these amazing people. People who I believe truly care and are just concerned. People who had no idea what my week was looking like in terms of the pain and the sickness. People who had no idea what a fight each day of these last few days have been. How absolutely terrifying it feels to be seriously ill and to develop a "minor" infection. How frustrating it is to realize that once again your plans for getting better and moving forward are "derailed". So when I opened their messages and read their words I knew that they simply don't understand. They don't understand what is going on or what the day has held. They don't understand that some words are just plain discouraging and like a knife through my breaking heart. "Rebecca, I am just concerned because it has been a couple of years now... I thought for sure you would be better by now... Even people with Cancer usually are better after a couple of years of treatment..." On and on the words are written... expressing concern that that this Lyme journey is not "going faster". On one hand I smile because I think, "you and me both sister" and on the other hand I cry because this is definitely the deep frustration of each day. The source of many tears and the beginning of so many prayers... "Lord, today please bring healing." Unfortunately though this Lyme journey has a long and winding road to healing. It is not "straight" by any means and comes with a thousand detours that you never expected. Typically when you get sick you take medicine or follow the course of treatment and you start to feel better each day, week, month, or year that you are on your health journey. Sometimes this healing comes quickly through antibiotics and after 24 hours you are up moving around and by weeks end you are having to force yourself to remember to take the antibiotic. 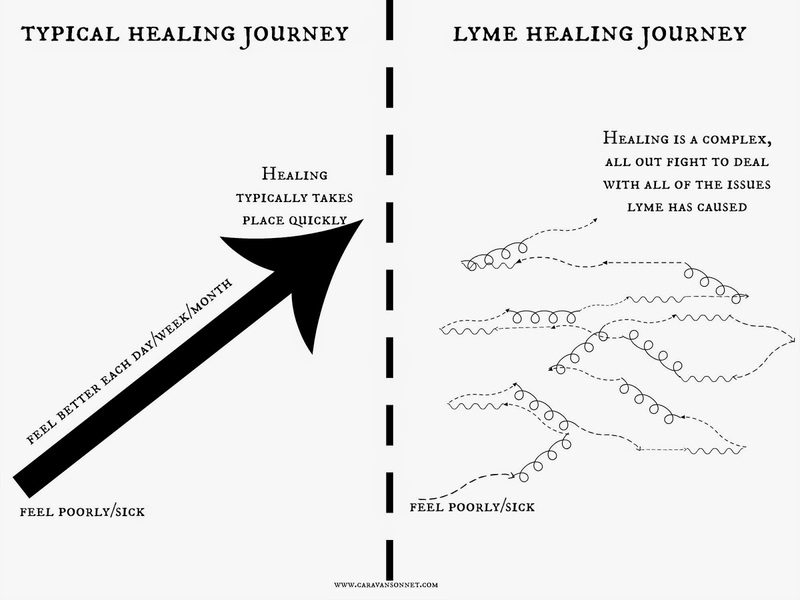 But with Lyme it is not like that... you constantly feel poorly and sick and the journey to get well and heal is anything but a straight line. Y'all this is exhausting. And discouraging. And the source of many many tears. It is so hard to keep fighting day after day especially when you are looking for things to find that you can pinpoint "are getting better". But in the midst of this long and winding road to get better... in the midst of the tears and the pain and the frustration... and in the midst of the awful and painful... there is still hope. Take one day at a time friends and when that seems like to much take one minute at a time. You can do this. You have got this. You can beat this. One minute at a time. One hour at a time. One day at a time. Every minute, every hour, every day is one step closer to healing. I wish I could say something to ease your pain....that graphic alone about healing is so daunting. These posts say so much about you and your spirit when despite the pain and discouragement hope is maintained. Thinking of you and sending hugs your way! Thank you so much for your sweet words and your encouragement. Your words were so encouraging in the midst of some discouraging times. Thank you so much for your sweet thoughts and kindness!! I hope that you have a wonderful weekend! Thank you so much for stopping by and for leaving such a sweet comment! I am SO sorry to hear of your fight with Lyme Disease and the different coinfections!! Truly, I am so very sorry. This is such a difficult disease and it breaks my heart at so many people who are fighting it. 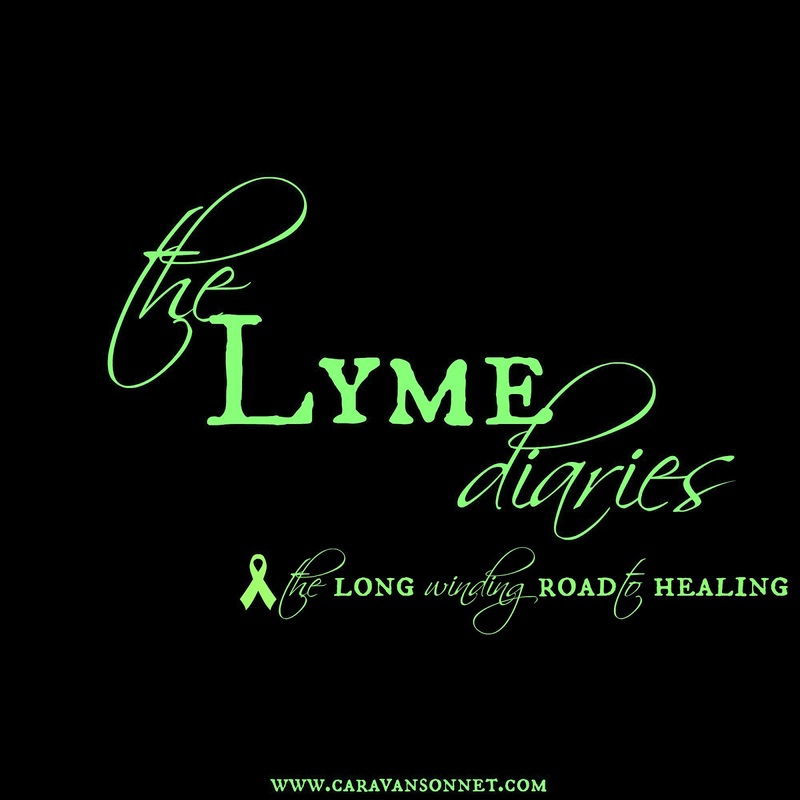 Thank you so much for your encouraging words about writing about Lyme Disease here on the blog. It can sometimes be difficult to do so your words were such a lovely encouragement to me. Thank you so much for your prayers! I will be praying for complete healing for you too!!! Thank you so much again for stopping by and for your sweet comment! p.s. I would love to have emailed you directly back but unfortunately you are a "no reply blogger". I hope to connect with you more in the future! !